In the time before the DragonLords walked Tal'Vorn, before the humans landed in their screaming ships of yellow flame, a single Race lived within the woodlands, grasslands and the forests of Tal'Vorn. This Race, though not immensely populous, was exceedingly long lived and thus, with time, had spread across the entire of the Eastern Land. They had slowly evolved in the quiet places of Tal'Vorn, avoiding the high mountains and great plains where the more unpleasant monsters made their homes, secure in their own power and their ability. Calling themselves the Ist'A'Breth, meaning 'Blessed in the Light', this Race was technologically young and yet themselves ancient, with a history stretching back many generations. They developed a highly ritualized culture, with strict adherence to tradition and the accepted normality. They where slow to change, slow to accept an altering in their reality or their world. They had their own highly structured religious system, believing that when they died their bodies would return to the planet, to the Life Flow. And thus the coming of Grathis was like a sledgehammer. Whether or not the God of Knowledge and Mani knew that the Ist'A'Breth existed is unknown, and since none can know the mind of a God, not likely to be known either. Regardless, his actions were the same and they had the same devastating effect upon the Ist'A'Breth. The Mani that Grathis created, the Mani that allowed the other Gods and their creations to utilize Magic, was an anathema to the Ist'A'Breth, a most lethal poison that killed thousands in the first month. The Ist'A'Breth had no choice but to retreat, their usual tenants of order forgotten, their culture and rituals forsaken simply to survive. They travelled across the lands of Tal'Vorn on foot for many years, all aiming for one destination, using all their skill with their magic, the Scripture, to try and stave off the effects of the Mani. Though many thousands survived to reach Lathrandar Forest, millions died, their bodies collapsing as they walked, before the power of the Scripture destroyed their cells, bones and flesh - Returning them to the great Life Flow. When they finally reached the Lathrandar Forest they were horrified to find that it had been occupied by the children of the Lady Vriclar that called themselves the Elves. The Elves, however, were still nomadic, moving about the forests and living in the treetops, allowing the Ist'A'Breth to avoid them for the most part. And where they could not, when the Ist'A'Breth ran into a tribe of Elves, a few spells from the Scripture was usually enough to allow their escape. It took almost a decade for the majority of the Ist'A'Breth, having entered Lathrandar Forest, to reach their final city of Lara, their greatest capital and the only place where there was enough Scripture Runes to hold back the Mani Sickness. By this time the original government had long since collapsed, the Ist'A'Breth all simply focusing upon the century long walk and struggle across Tal'Vorn's face. However, now that the Race was together again, they looked to a new leader, one who could guide them and help them to rebuild their shattered existence. The Ist'A'Breth are not immortal, though they can live for many centuries if not killed or laid low by the Mani Sickness. In some ways they resemble the Elves, with delicately pointed ears and slender, almost fragile builds. However the Ist'A'Breth evolved within the forests and were not created like the Elves. Thus the Ist'A'Breth were even more at home within the high forests, their ears having evolved to pick out the sounds of attackers in the woodland, their flesh a very pale green and mottled to hide them in the leaves, eyes a dull red without pupil or iris, designed to see in even total darkness. Once the Ist'A'Breth where a peaceful race, with no need for the tools of war, their Scripture Magic being more then enough to hold off any of the more aggressive natural Tal'Vorn wildlife, however with the coming of the Gods and their children, times changed and the need for the art of war become dire indeed. This change was highlighted most in the way the Ist'A'Breth referred to themselves, for in their society names reflect upon who someone is beneath their façade of daily lies. Ist'A'Breth, Blessed In The Light, no longer fit a crippled and vengeful Race, a Race abandoned by world they had been born to protect. 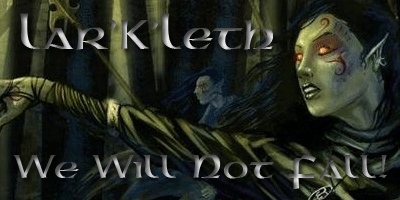 Thus they changed their name to the Lar'K'Leth which means 'We Who Shall Not Fall'. From that moment the entire purpose of the Race was altered, the Lar'K'Leth focusing their remaining, weaker, Scripture magics upon more effective defensive and offensive Scripts and schooling themselves in the arts of war. Outnumbered by the other, newer denizens of Lathrandar, the Elves and the Beasts, the Lar'K'Leth formed a hit and run form of warfare, their strange eyes and uncanny sense of hearing allowing them to become expert trackers and huntsmen. With their withdrawal into the forest, the Lar'K'Leth began to form a symbiotic relationship with the woods themselves, becoming more a part of the forest then any other living thing within it. Born within the woodlands, knowing that the death of Lathrandar Forest would mean the death of the Lar'K'Leth, and the forest knows that if the Lar'K'Leth were to die, then the defender of the trees would be no more and the great forest would follow soon after. Because Lathrandar Forest was the place where the Goddess of Life, the Lady Vriclar, first trod upon the face of Tal'Vorn, is gifted with a strange semi-sentience and the oldest of the trees seem to have minds of their own. Many strange and intelligent humanoid creatures make their home amidst the woodlands. The Dryads, or the Il'tain in the Lar'K'Leth tongue, are highly aggressive tree spirits which have two forms. The first seems to be a mimicking of the Elven image of Vriclar in that they resemble a delicately featured, wild woman, leaves in her hair and clad in bark, grass and moss. Yet when angered, as they often are, their features seem to shift and melt, their flesh becoming as hard as bark and their limbs turning to branches. In this form they have the strength of tree roots that can crack stones and oaks that can withstand hurricanes. Yet other creatures are even closer to the trees, some saying that they evolved from the very forest itself similar to how the Lar'K'Leth did. Resembling little more then mighty plants, these creatures, these Issa'rn, are even spoken of in human legend as the mythical Treemen. And indeed these creatures have now grown so rare that they are almost extinct and when one falls, either in battle or through misfortune, it is a cause for great sorrow amidst the already mourning Lar'K'Leth. Most inhabitants of the forest however are less powerful, though perhaps more vicious. They stir up the trees and cause the endless maze of pathways within the forest to shift and change from day to day until it is almost impossible to map the forest for more then a few weeks at a time. Of course this does not effect the Lar'K'Leth who have no need for maps within the forest that forms their home, the Beasts simply wander where they will and gather at their Waymarkers easily enough for the forest refuses to grow near these conduits of power and of course the Elves simply travel through the tree-tops in straight-lines. Lar'K'Leth society is as simple now as it was once complicated. Everything is geared for war. Any able bodied Lar'K'Leth, male or female, is trained to fight form a young age and taught how to handle a bow often before they can walk. Because the forest provides food and water there is no need for farming and clothing can be made from grass, shed bark or the leather of animals for the Lar'K'Leth respect only the Forest, not the things that live within it. The greatest of the Lar'K'Leth archers can shoot in total darkness, their eyes blinded, and still hit at a distance of more then three hundred yards, their Scripture enhanced bows allowing them to shoot far further then is naturally possible and are known as the Has'ter. However there are many ways to wage war and, though the Lar'K'Leth are the unsurpassed masters of the ambush and the hit-and-run, just as the Beasts are expert raiders, the Dwarves superb siege-engineers and the DragonLords, Demons and Anvar consummate shock troopers, the Lar'K'Leth have been known to engage forces in other ways. For some the sorrow of their dying Race simply becomes to much to bear and they will abandon all their worldly possessions, keeping only basic clothing, their Scripture amulet and a pair of swords. Calling themselves the Wis'arn these Lar'K'Leth leave Lara with the intention of bringing the fight to their enemies, to drown their sorrow in a flood of rage and glory. However these Wis'arn are still Lar'K'Leth, are still connected to the forest and thus will not simply lie down and die. They fight with all of their considerable skill, turning their speed and agility with a longbow into furious, frenzied assaults, ducking, diving, leaping through combat almost like a dancer. On rare occasions the individual Wis'arn survive and join up with others of their kind, forming small armies lead by the wildest fighter, the most frenzied dancer. These Wis'arn, the Wis'arn'ai, mark their leadership by the usage of a long spear instead of two swords, the wooden shaft allowing for even more exuberant dances and movements. It is said that a Wis'arn'ai can strike an opponent anywhere, even if they are separate by up to 100 metres, within a heartbeat. The third form of war used by the Lar'K'Leth, other then the ambush and the wild charge favoured by the Has'ter and the Wis'arn respectively is utilized by the Scripture Casters. They use the very power of the forest itself against the invaders, turning the full force of the Scripture against the living flesh of their enemies. The full wrath of a single Scripture Mage can be terrifying, especially when he is near Lathrandar, and a group of them is a force to be truly feared. Yet, unfortunately, the number of Scripture Casters is falling every year as they are killed, die of old age, or are beset by misfortune. Indeed it is this, misfortune, that seems to plague the Lar'K'Leth as a Race. Ever since the Gods came to Tal'Vorn, this race has been on the back foot, forced to retreat into the deep forest, forced to live in seclusion, slowly dying out and unable to do anything about it. It is a source of unending sorrow for the Lar'K'Leth and a font of incredible rage that drives some of them into fits of violence against the other races that would do a Demon proud. Yet, despite it all, the Lar'K'Leth still strive to live with the forest, as one with the trees and as one with the place of their birth, knowing in their hearts that their time, and the time of the forest, is numbered. She was a blur, a twisting blur of limbs and wood and a blade that we couldn't even keep in one place, let alone hit. She killed David before we even knew she was there and more then a dozen of the others followed before we could even finish drawing our swords and prepare any spells! But for all of it's lethality, I must say that her dance was beautiful. Her long dark hair seemed like the sea, her pale flesh tinged with green, limbs lithe and smooth and clad only in simple brown cloth. Her visage was covered in delicate whirling tattoos, intricate endless patterns of swirls and whorls and circlets, all merging together, etched into her pale flesh in a deep bloody red, red like her eyes as she stood over me, spear planted into my thigh and thus the ground below me, staring into my eyes before smiling, jerking her weapon free and vanishing back into the woods. She only let me live so I could tell you this, so I could tell you not to go into the forest. . . The ramblings of an unnamed Order Mage, later executed for incompetence in killing one aggressor.